Material/Waterproofness/Breathability:AquaDry Pro is Craghoppers highest performing fabric. Fabric is soft and lightweight allowing small volume stowage in back pack. Inner polyester mesh upper lining, polyamide lower lining. Kept rain out all day with good breathability. (Steady drizzle, low wind speeds). Overall Design: Front opening for additional flexibility in ventilation. Good size storm flaps over zipped pockets. Front opening has double folding storm flap which stores drawcord mechanism and is very effective at keeping out the weather. 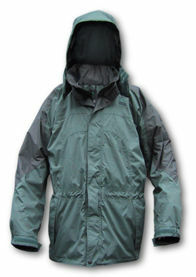 Draw cords can be adjusted by undoing only one layer of front stormflap keeping wearer dry/warm. All seams double stitched. Fit: Tester: male, 5' 11'', medium build) Good length (to just below backside). Draw cords at bottom and waist. Sleeves on long side - good while walking, but get in way when trying to read map, adjust draw cords. Plenty of room for internal layers. Main zip opens all the way down front of jacket - this is covered by double folding storm flap. Zips on side pockets covered by well designed 'reversed' storm flap. No underarm zips. Zips: Main zip opens all the way down front of jacket - this is covered by good size storm flap. Other zips on pockets (see below) also well covered by storm flaps. Internal zip is available to take a compatible fleece. No underarm zips. Pockets: 4 good sized pockets: 2 external at waist height with storm flaps, 1 external at left breast height big enough for several OS maps, 1 internal at right breast height. Map pocket good when jacket done up but tends to hang awkwardly when jacket worn with front undone. All pockets except internal readily accessible when wearing a belted back-pack. Hood: Good size hood which can be rolled away. Hood has 'stiffener' around the front plus draw strings to allow adjustment around front . Second drawcord at back pulls hood tight around crown like a hat - excellent. Good face guard - no gap between this and the collar. However, face guard cannot be secured when open where it flaps annoyingly in the wind. Cuffs and Collar: Cuffs tightened and loosened via velcro fastenings. Collar can be fastened right up and sits well with face guard. Cuffs tended to retain water leaving them damp and cold. Care and Maintenance: Basic instructions provided. Good fit, good pockets and storm flaps are generous. Good overall performance in these test conditions but I suffered damp cuffs, the face guard flaps around when not in use and the breast pockets hang awkwardly when jacket is open.